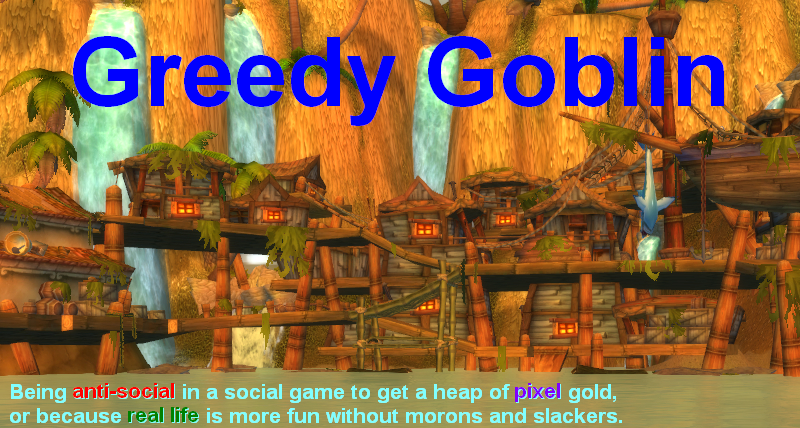 Greedy goblin: World of Tanks cheat: it's the economy stupid! World of Tanks cheat: it's the economy stupid! This is part 4 of a series, see part 3, 2 and 1 first. World of tanks is a free to play game, with some pay-to-win elements. While gold ammo is indeed overpowered, it's expensive enough to keep most players from using it. Cosmetic nonsense is sold but no one cares and there are gold-only tanks but they aren't overpowered. The feature that brings the money to the developers is subscription. What does it do? Increases XP gain by 50%, which isn't really interesting if you are not rushing anywhere just play the game. Its other effect is increasing credit gains. Credits are important part of the game. You not only spend them on buying more tanks but on maintenance of your current tank. If you don't make enough credits, you can't continue playing with your favorite tank and must go to farm credits with lower tanks. Maintenance costs increase with tank tier. The wiki says that you get a few credits for joining the battle but most of your credits must be earned by damaging enemies, spotting them for others to damage and capturing objectives. These credits are multiplied by 1.5 if you have subscription. Tank maintenance means repairing the damaged tank, credit cost depends on HP lost in the battle and tank tier. You also have to replace used ammunition and consumables, top level ammo is pretty expensive. The maintenance cost can be higher than credits earned, ending the match with a net loss for you. The subscription gives you no income at all, it multiplies the income you make by playing. If you did zero damage and zero spotting, it will multiply only the near-zero base reward. It means that there are two hard skill limits for every tank tier: the higher line is the free-play line. If you are better than this, you earn enough credits to maintain that tank without paying subscription. Divide this "skill number" by 1.5 and you get the scrub-line. If you are worse than that, you can't maintain your tank even if you pay subscription. You see the catch? Subscription can only be sold to "average" players, the ones between the two lines. Those who are better than the free-play limit don't need subscription. They may buy one for convenience, especially if they want to get tier 10 tanks for clan matches but most of them won't pay a dime to the developer. Those who are below the scrub line have absolutely no reason to pay as it won't do them any good. They are practically paying for multiplying zero by 1.5. Gold tanks have higher multiplier but that still doesn't help if you have nothing to multiply, so bad players won't spend on gold tanks either. The 1.5 multiplier places the two lines very close to each other. If we assume that the average (or median) player is halfway between the two lines, then the scrub-line is at 80% of the average and the free-line is at 120% (80*1.5 = 120). Let's approximate skill with kills. It's far from perfect but follow me please. The average player has 0.74 kills/battle. So if you have less than 0.6, you can't play in a tier that meant to be playable for an average player, even if you pay subscription. If you have more than 0.9 kills/battle, you can play that tier for free. The most iconic gold tanks, the Type59 and the Löwe are at tier 8. Tier 8 is where people farm their credits, so an average player meant to have income in T8 assuming he pays subscription. I have 1.23 kill/battle with my Tier 8, way over the free-limit. It is 67% higher than the average, so I should earn more credits without subscription than an average player earns with subscription. I didn't earn anything. I continuously lost credits, about 100K over 40 games. The debriefing screens clearly shown that I could earn lot of credits if I'd have a subscription. But I should be earning now! This is the purpose of the cheat. In order to make World of Tanks profitable, every player must be held between the scrub and the free limits. Someone outside the limits is a lost customer. The goal of the cheat is not to give you losses, it's not to deny you kills, it is to deny you income over the limit. Similarly it's not about to boost a horrible player to wins or kills, it is to give him credits to have something to multiply. You can have significantly higher winrate than 50%. You can increase your XP gain. You can get medals. But you can't earn significantly more or less credits than the average player. Since credits come from dealing damage, the game needs to mess with your damage. Since winners survive and losers don't, in order to give you maintenance cost, the game needs to mess with your winrate. Also to give others damage, you need to get damaged. What you experience during battles is a by-product of the cheat that aims to set your "proper" income. This is why gold ammo is now available for credits: since it cannot earn its price, even with ideal hit, the algorithm can't care less if you increase your winrate with it, you are losing credits. Please look at these two income sections. They were made when 300 gold was given for changing your password, so we had a 1-day subscription. There was also an event, giving 15000 credits for a medal. Without event and subscription my girlfriend earned -5587 credits while I earned -2361. Maybe we just weren't good enough on this battle. I mean our performance could easily be worse than 1.2x the average, therefore did not deserve income. Maybe this is average play: On this battle each of us damaged more than the rest of the team combined. With subscription it earned lot of credits. Without it, negative. I'm of course not saying we always played like this. It would be OK to gain credits on this and still lose on average. But we lost credits even when we had the above performance. You can literally do miracles and still lose credits on the same battle where drooling morons gain credits - with subscription. We know what the cheat wants. We know how does it work. And we know for sure that every cheat can be exploited. Tomorrow you will see how can you double your XP gain, triple your credit gain, and pull awesome stunts (like that unkillable T-50-2) at the cost of making the battle a pain to everyone else involved. PS: I'm obviously not saying that the developer shouldn't earn money or should allow anyone to use its service for free. The problem is that WoT officially allows you to play the game fully for free, but makes it impossible via a cheat. Officially you can earn credits with a T10 if you play good enough. Practically, you can't even do that with a Tier 8 when you are just becoming Ace Tanker. for 4 posts you've banged on about this being a cheat. If indeed the game behaves as you claim it does(and we will forget for a second your ignorance of pseudo-random number generation, quite obvious apophenia and general tin foil hattery) it cannot be a cheat because it is a game mechanic. You are not being cheated, the game rules are being applied to you as equally as they are to everyone else who plays the game. To call this a cheat is like saying using a knight in chess is a cheat. It is part of the game design and if it is actually occurring (which I strongly suspect it isn't) then it is legitimate. You clearly has no clue. The game operates differently than the declared ways. It's like a roulette machine in the casino that never gives red. If it's unintentional, it's a game-breaking bug. If it's intentional (which is likely), then the house is robbing you by rigging the game. It is true that it affects everyone, I didn't blame any players with cheating. It's the game developer robbing its customers. Question: Does WoT specify somewhere how it's matchmaking mechanics supposedly work? The wiki has a large button-link on the official site http://worldoftanks.eu/game/ so it is endorsed by the developers. Also, the button we press has "random battle" on it, so one rightfully expect a random battle instead of a carefully tailored and controlled environment where his results have little connection with his actions. Seeing that your performance in those games was clearly above average, there are still some facts you need to consider. First, the different tanks aren´t equally good for earning credits. Especially TDs and SPGs are common to not gain much wealth. The regular "Break Even" point is at around T7/8 for non premium average players, with most of the tanks. Secondly, did you use any premium rounds for these rounds? The ammunition costs seem to be a bit high indeed, but I cant recall the exact cost per shell for now. Overall, there are many players who dont have big problems keeping their tier supplied with credits. Another flawed post - you do realise the AT15 is notorious for being a credit drain? It's shells cost too much for the damage they do and due to the guns quick reload you can fire off a lot of them in a battle (46 in your screenshot for example, compare that with around 8 I typically fire in my JPE100). You're making wild claims based not only on a very limited dataset but also taking extreme examples that are biased in favour of supporting your point, unfortunately to all but the most gullible you just come across as looking stupid. 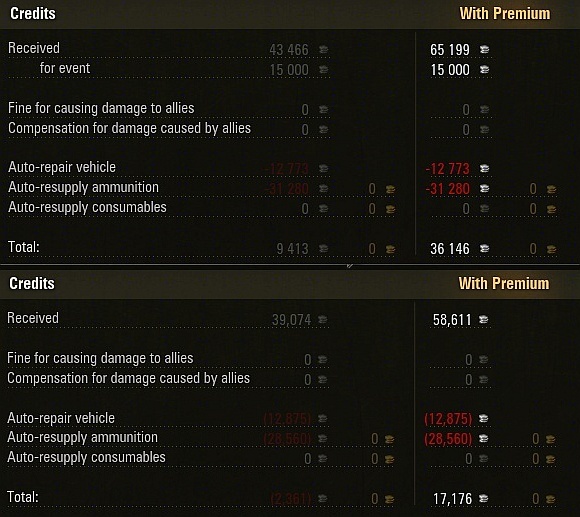 @Nick: you are horribly wrong, as AT7 uses the SAME ammo and by some miracle, that tank earned around 10K/battle, while my AT15 had -4K/battle. The repair cost difference is less than 5K between the tanks and 49% survival rate, so repairs never were a problem. Simply I started to get unlucky in critical moments. For example in this battle I had almost 2x more misses than I use to have. is wrong because it says exactly what the system SHOULD be instead of what it is: "It pays to be an effective player – this you will be able to even make a profit with high tiered tanks where other players are already losing money." How more effective can you be than ace tanker? It doesn't matter how good your hitrate is, it doesn't matter if you have 50%+ survival rate, it doesn't matter if you have top 1% winrate, it doesn't matter if you earn more medals than the victory screen can fit in, you'll lose credits anyway. Having 5 premium ammo in battle helping you to stay alive against tough targets whenever you facing them (to push the limits, to stay alive, to win the battle). All of that increases your battle income assuming you not a dumbass. Premium T8 tanks (I have both SPershing and Type 59) helping me to farm for new tanks where all dumbasses farm, so I can be efficient. They give me income without subscription same as I'll have on regular T8 with. As you can see it decreases with tier, my skill remains constant (or even improves). It should be noted all battles on Patton III I played in top condition (Crew 100% and I got top gun right from the beginning) That got me frustrated and kept me from playing WoT almoust a year. P.S. Screenshots will be available 30 days, so if you want to keep them reupload them on your hosting. Sorry for long post. Good luck with your findings. Since when are non-premium tier 8s credit farmers? the most profitable non-premium tanks are tier 5 and 6. The same site also ranks the AT-15 as 229th of 280 tanks in terms of earning potential, with an average net income of around -4,000 credits. I would be interested to see your results for the AT-8, or better yet, the StuG III. I'm intrigued by the nature of proposed exploit. Is there a way for players to affect starting positions? Probably not. So the exploit is likely to be an economic-based. Something like "leech on other players". @Souldrinker: close, but wait and see! @Anonymous: the question is why did I get exactly the average income with AT15 when I played way above average. My AT8: I used that tank for farming with very good results, I'd guess 10K/match, 66% winrate and so on. @souldrinker: Since this blog is all about exploiting M&S i assume yes. Started new account to collect some data, I'll be playing bad on low tier tanks to maintain my WR 48% (not defending lonely lines, pushing allies out of cover, firing in bushes so all allies there will be spotted) and tying to play good on tanks tier 7+ If I get it right my perfomance on those will rock to skies. I don't think WG ever stated that all tanks are profitable. I think they stated numerous times though that unprofitable high-tier tanks are intended - to keep low tiers with cred farmers populated. You would only have a point if all you could have is one tank in this game. This clearly is not the case - as a f2p WG intended that you should play a few rounds in the tank you want to grind, then a few rounds with a t5 credit maker. Your oppinion of how a f2p game should be differs from WG's published oppinion, I get it. What I don't get is how this should be a cheat? The AVERAGE tier 8 can be unprofitable, that's a legitimate game design. The cheat is that they offer that you can earn credits based on your performance, and then you can't. Everyone earns the same credits with the same tank, regardless skill. This conserves ammo, and still allows you to win ~50% of your games. Even in games you lose, your tank may survive if you chose good cover. @Dáchéng: if I'm right, you can't really leach since the matchmaking will make up for your uselessness. Being AFK is NOT a good way to leech as you get little credits since you make no damage. You must cause damage or spotting to get credits and XP. On the other hand - if it gets widespread - it will ruin the fun of those who want to play the game normally. Yet, this is called afk-botting and can be the reason for a ban. I can only repeat myself: not every average T8 tank will get bigger amounts of profit. You chose the AT-15, a tank renown to gain little creds while having a fast firing gun with relatively high shell costs. It´s pure logic that you´ll lose credits if you fire often and dont deal outstanding dmg. Try the same with an IS-3 or T-32 and you will get some 10k profit. First of all - the match you picked isn't really a good indication. Getting lots of xp (requirement of ace tanker) and getting optimal amounts of creds is not the same thing. I'm looking at your terrible hit ratio (should be around somewhere 80% to be an above average CREDIT player), low pen ratio and low spotting damage (I'm just telling you how to earn lots of creds, not that you should go and scout in an AT15). So yes, while your match was outstanding in terms of xp, this doesn't mean it should or would be great creds as well. Likewise, being unprofitable doesn't mean it should have a positive balance on good matches. Wait until you get to t10 - you get damage - it's highly likely you will have a credit loss no matter the xp you earn. You earned credit by your performance - for 67% hit ratio with a terrible damage/cr gun, a pretty beat-up t8 tank and next to zero spot damage this is what you should get. A worse player would have even higher loss. A better player with higher hit ratio would have positive balance. Why is this a cheat? If you can prove that someone with the same tank, for the same amount (and composition) of damage, spot, kills, etc. gets more creds or less, you would have a point. Now, I'm not so sure. Well, give me your ingame nick and I'll tell you how good you really are. 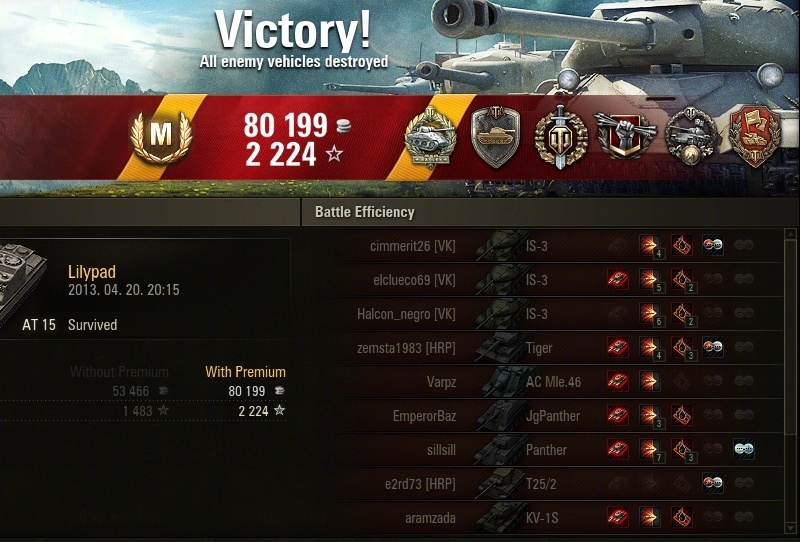 Ace tanker badge does not say much. Specially if you waste alot of shells (those become primary source of credit drain in tiers 7 and higher) for pot shots or you miss, or you don't do damage with them. Another thing to remember: if you do not spot your own targets, you get 50% less credits per damage done, so pure damage done is not always a sign of great earnings. @Anonymous: if you check the screenshot above, I have 80% hit ratio with AT15, 66 on this match. I wonder why? This is what I'm trying to explain: the game tinkers with your shots, your initial placement, spotting and everything to make sure that you can't earn credits. It doesn't cheat on the summary board but on the field and can change even a spectacular result into a credit loss. On that battle I had misses when there was barely a pixel in the circle that wasn't the enemy tank, my girlfriend got nondamaging penetrations in a row. We could still win, but burned just enough credits to provide the expected result. This is quite an accusation. Do you have any idea how hard would it be to implement something like this? And so it works in real time? This is almost AI level stuff. Do you know how shell dispersion calculation is working? tl;dr; version: nearly 20% of your shots go to the edge of the aiming circle. Wait for next patch which will bring different shot dispersion mechanics (only about 4% of shots will go to edge of aiming circle), you'll probably rethink this rather far fetched theory. Let's suppose this cheat wouldn't exist, and a skilled player could win an average of 10k credits in a tier 8 without premium account, with an average 30k income and 20k maintenance costs. To afford a 6.5 million tier 10 tank he needs 650 battles. But with premium account his gross credit earn would increase with 50%, which means 45k income - 20k maintenance, for a 25k profit, an actual 150% increase on practice. It's not about being able to afford a tier 10, even a 40% scrub can do it by farming with low tier tanks, it's about hwo long it will take you. Gelvon, are you familiar with the way that Tanks treats TDs and arty? Both, in the current version, receive penalties for doing damage at long range. Tier 8s regular tanks aren't effective credit farmers. Non-penetrating shots are almost always a function of spaced armour. For good proof you would need to drop down to the replay level. Have you done any sort of population study? The break points should be obvious in win rate distribution. They should go nonlinear at the break points. I like how everyone is blind. If he has no right why WG repairs hes algorithm. This one was introduce in earlier patches, not comes with 0.8.5. Yet as this blog got into air it is corrected on the right next patch. Maps, tanks said coming are delayed more and more to be balanced, yet when they appear ARE overpowered. Remember the Type59 first times appeared and how it changed during the time. It simply don't shine as it did and WG will never make it again so powerfull. And if you dont like dont read it. All of you come for the cheat word to became better and get bored about something not said but what you can feel during thousands of match, if you are not lemming. @Gevlon: so where are your AT7 stats where you're making money? You're correct it has the same shells but if you play it the same way (firing off 46 rounds in a match) I can't see how you're making money in it unless you're doing 5k damage etc. a round. Do you understand MMO games at all? One of the fundamental parts of them is balance, if you don't have balance then players get very upset very quickly and will leave the game. Yes the Type 59 was unbalanced, that's why it got nerfed (and rather than keep nerfing it more which they really should they've stopped selling it - that's a mistake on WoTs part but it doesn't support your point that they seemingly released it to get loads of people to buy it to make loads of money then nerfed it after). As for changing algorithms, ofc things will change over time, I can bet you they were testing it long before goblin's blog posts materialised. The WoT heads guys are very arrogant when it comes to dealing with their customers (understandably so in some ways as most are whiney little kids...) they certainly wouldn't quickly change a key game system based on some guys poorly researched blog posts, there's NO statistically relevant evidence being presented in ANY of goblins posts (and I studied statistics at university).